In light of Pope Francis’ call for a synod of bishops on young people, the faith and vocational discernment, the Diocese of Rochester and individual parishes have increased their efforts to meet the pastoral needs of young adults between the ages of 18 and 39. The following is a sampling of programs that parishes and the diocesan Office of Evangelization and Catechesis have recently offered or are planning for young adults, both married and single. Theology on Tap, the popular discussion series where young adults and local speakers gather at a bar to discuss and reflect on various faith-related topics, kicked off a new series in August. Jonathan Schott, associate director of campus ministry at St. John Fisher College, led an Aug. 27 discussion at Corner Sports Bar in East Rochester on Pope Francis’ 2015 encyclical “Laudato Si: Care for Our Common Home.” Approximately 30 young adults attended. Mark Capellazzi, the diocese’s new project manager for youth and young-adult ministry, has been working on arranging the rest of the speakers for 2018-19, Barkin said. In the works are an evening on Franciscan spirituality and a talk on the call to priesthood by two siblings currently in seminary, she noted. “Theology on Tap provides an excellent opportunity to explore the doctrine of our faith and how it is reflected in modern society. The structure of the evening lends itself to relaxing and learning at the same time, which is always appealing,” said Leslie Barkin, coordinator for youth and young-adult ministry for the Office of Evangelization and Catechesis. In order to better meet the schedules of young adults, Barkin said her office changed the format for Theology on Tap from a consecutive four-week series offered four times a year to a single monthly event conducted in all but the summer months. During the summer, a new diocesan initiative, “Grilling with God,” will replace Theology on Tap. The inaugural “Grilling with God” event took place in July 2017 at St. Bernard’s School of Theology and Ministry, Barkin said. After the inaugural event’s success, a group of young adults worked with Barkin to offer “Grilling with God” at St. John the Evangelist Church in Spencerport June 14, where more than 40 young adults attended Mass and a cookout in the rectory’s back yard. Following that event, Barkin said Matthew Grosodonia suggested and planned “Grilling with God” at his parish, Peace of Christ’s St. John the Evangelist Church in Rochester. Approximately 30 young adults attended the evening, which began with praying the rosary in the parish’s Father Edward Zimmer Garden before Mass for the Solemnity of the Assumption of the Blessed Virgin Mary on Aug. 15. Afterward, the young adults gathered in the parish hall for fellowship and to make their own garbage plates. 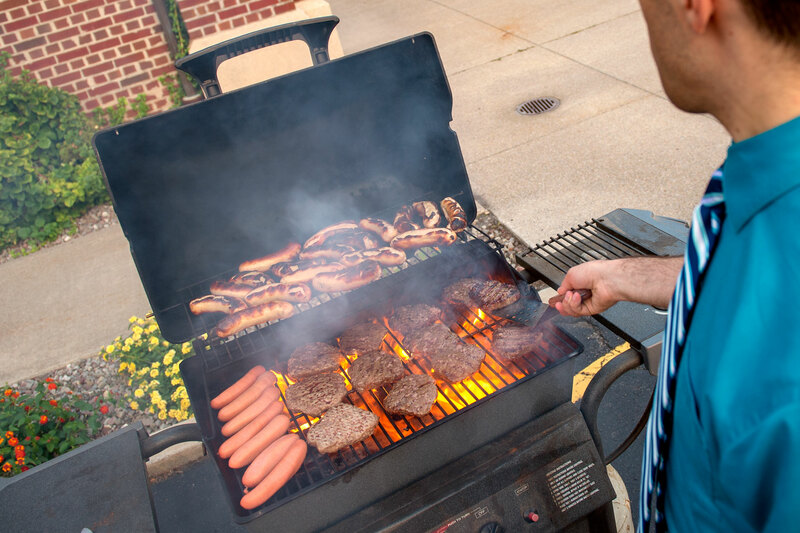 “Catholics and meals always go together well; it is in our nature to gather to pray, share and eat, so ‘Grilling with God’ has a time-tested formula that works,” Barkin noted. On the second Friday of the month since May, young adults from around the diocese were invited to Church of the Assumption in Fairport to pray together and gather at a local eatery through an enrichment program called MAPS — Mass, Adoration, Penance and Social. The evenings began with Mass, adoration and the opportunity to receive the sacrament of reconciliation. Afterward, the young adults walked together to a nearby restaurant for food and fellowship. Erin Bankey, a young-adult parishioner of Church of the Assumption, created the idea for the program. While she was living in Arlington, Va., her parish started P3 — Prayer, Penance and Pub on Wednesday nights, which Bankey said drew around 100 people per week. “It was something that I really enjoyed doing and getting involved with,” she said of the program. When Bankey moved to Rochester in 2016 and started getting involved at Assumption, she brought the idea to Donna DeJoode, assistant director of faith formation, who agreed to a summer test run of a similar program. to see if it would catch on locally. DeJoode told the Catholic Courier in an e-mail that MAPS will continue in the fall, with the next evening scheduled for Sept. 14 at 6 p.m.
An initiative similar to MAPS was conducted in Irondequoit on Fridays this summer. St. Kateri Tekakwitha Parish offered “Pop-Up Prayer Garden,” during which participants met up at various establishments around Irondequoit to pray the Liturgy of the Hours and engage in social activity. The idea was raised by Mark Keller, coordinator of liturgy and adult faith formation at St. Kateri, and was met with an enthusiastic response from other parish staff members. The title was suggested by Jessica Tette, the parish’s coordinator of children’s ministries, who based the name on “Pop-Up Beer Gardens” — various outdoor eating and drinking establishments during the warm-weather months in Philadelphia, where she resided from 2015-17. The inaugural Pop-Up Prayer Garden session was held at Marge’s Lakeside Inn July 6. Approximately 15 people attended for evening prayer near the entrance while bar-goers filed in during peak Happy Hour time. The Pop-Up Prayer Garden returned to Marge’s on Aug. 3 and Aug. 31 Camp Eastman, I-Square, the playground at Christ the King Church and Bill Gray’s Restaurant near Seabreeze Amusement Park also served as locations for the initiative. All gatherings except those at Marge’s, which was geared toward young adults, were open to people of all ages.